Want to try out School Staff Surveys for yourself? Sign up for a free trial account here. If you want an easy way to run regular staff engagement surveys in your school, try www.schoolstaffsurveys.com today. About the author: Bruce Greig is an entrepreneur and has been a school governor since 2011. He served as Chair of Governors through two Ofsted inspections and four headteachers. He set up SchoolStaffSurveys.com after discovering how enlightening an anonymous staff survey can be and decided to make it easy for every school to run them. Ofsted have recently updated the Ofsted staff questionnaire which they use during an inspection. You may be familiar with the previous version which we have covered on this blog before. Were you working at this school when it was last inspected? Do you think this school has improved since it was last inspected? Leaders and managers take workload into account when developing and implementing policies and procedures so as to avoid placing unnecessary burdens on staff. This will definitely give you, and the inspector, more insight into how the school is run. For example, the question "Leaders use professional development to encourage, challenge and support teachers’ improvement" used to be simply "The school makes appropriate provision for my professional development". And "Leaders do all they can to ensure the school has a motivated, respected and effective teaching staff" is an entirely new question, as are some of the others. Should you use this questionnaire in between inspections to help you lead your school? It would certainly be helpful and might tease out some feedback which you wouldn't necessarily hear face-to-face from staff. But you might find it is not detailed enough to help you address any areas which you'd like to improve. For example, if you get a lot of negative responses to the "Leaders do all they can to ensure the school has a motivated, respected and effective teaching staff" question, what does that tell you? Why do some staff feel that you aren't doing a great job there? Because they are demotivated? Or they feel not respected? Or they know that a colleague is not very effective and you haven't done anything about it? (That last one definitely won't be aired in a staff meeting). The Ofsted questions are for the inspector: they want to know if everything is going well or not. They are less concerned with exactly what you need to do to address something that isn't going well. That's your job. 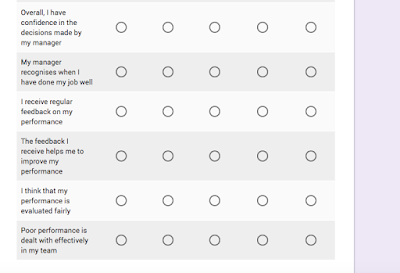 So you might consider using a more detailed questionnaire as your annual, or termly, tool to keep tabs on what your staff are thinking (alongside, of course, your regular day-to-day contact with all of them). 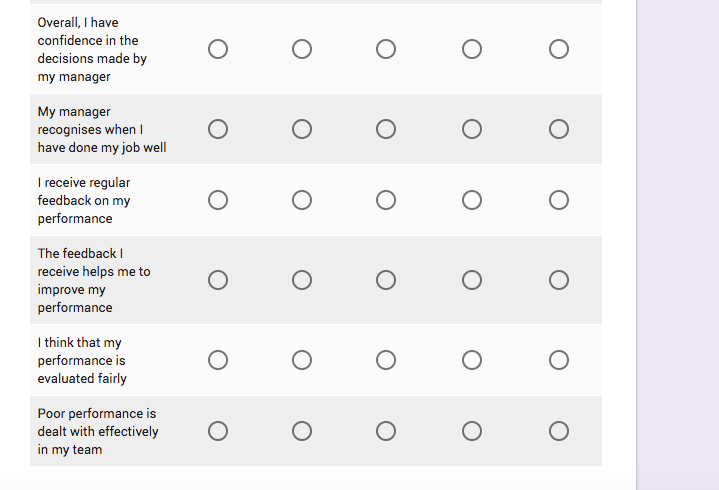 We like the questions used by the UK Civil Service: they are very detailed, but not too onerous. They are tried and tested throughout all branches of the Civil Service from the DVLA to the Cabinet Office. (Para 151 of the October 2017 edition of the School inspection handbook). My website, SchoolStaffSurveys.com, is one of several ways you can run a comprehensive staff engagement survey for your teachers. It isn't free (try Google Forms or SurveyMonkey for a free version), but it requires almost no configuration or setup on your part, and is really simple for your teachers to complete. And you get some nice graphs to show your governors. School Staff Surveys is live - a simple cost-effective way to run staff engagement surveys in UK schools. 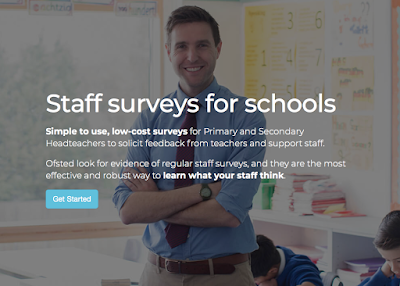 SchoolStaffSurveys.com uses the world-renowned questions from the UK Civil Service People Survey in an easy-to-use website which you, as a headteacher or other school leader, can use to survey your staff. Ofsted inspectors issue a 12-point questionnaire for staff to complete online during an inspection. Should school leaders use these questions between inspections to understand how their staff feel? The Ofsted inspection questions for staff do a good job of telling the inspector what staff think at that point in time, with enough detail to satisfy the requirements of an inspection crammed chock full with evidence and paperwork. But they aren’t really detailed enough to help school leaders understand what’s really working well, and what needs to change. If you are willing to invest a little more time and effort, you can get a lot more out of a more detailed questions. A more thorough alternative is the UK Civil Service People Survey. This has been used for years in across all branches of the Civil Service. It is relied on by leaders at all levels in the Civil Service to understand how their staff feel about their jobs. You can use it in your school to get the same sort of professional, in-depth understanding that Civil Service leaders have. It has many more nuanced questions than the Ofsted one. It covers everything in the Ofsted questionnaire, but in much more detail. For example, if staff respond neutrally to the statement “The school is well led” in the Ofsted Survey, what does that tell you? Nothing you can really act on. So you can see where, exactly, your leadership needs improving, and where you are doing well (in the eyes of your staff, at least). At Wallington County Grammar School, an Outstanding school, the Ofsted inspectors commented about how leaders listen to views of staff (and parents and pupils), and welcome feedback. 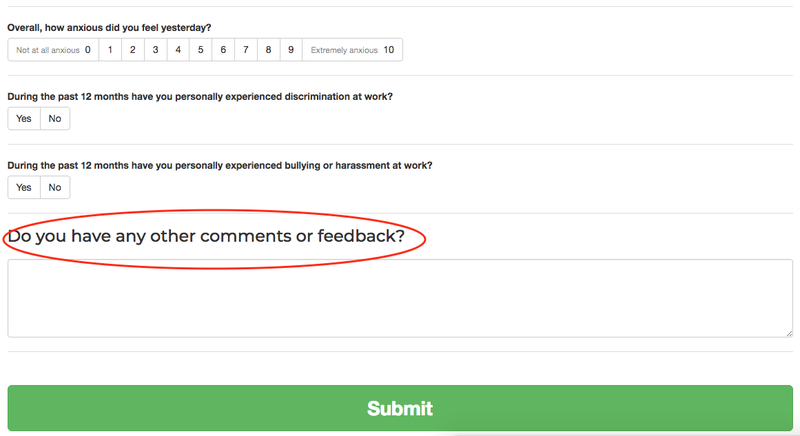 One easy and effective way to solicit feedback from staff is by using a regular, anonymous online survey.